Stephen Charrier, President of Rollerblade USA, and Rob Gill, of InlineSkates.com, review the 2015 Rollerblade Twister Pro Urban Inline Skates. Hey, welcome to the Daily Spin. I'm Rob from inlineskates.com joined today by Steven Cherrier from Rollerblade. Thanks for joining us, Steven. Thank you for having me. So, we're talking about the Twister Pro. Really cool skate in the urban lineup from Rollerblade. Moving up from the Twister 80. The big upgrades on this skate are really in the frame and the wheels though. It is. The Twister Pro has, starting with the frame, we have the Pro Frame on this skate so it's a 7000 aluminum, extruded aluminum frame. Really high quality, high performance frame. Still 243mm long. For sure. And then the wheels, you're moving into a Hydrogen Wheel. Yes, so you have Hydrogen 80mm wheel with a rounded profile to it so it's going to be a very fast high performance street wheel basically for... For sure. And then also incredibly maneuverable with that short, short wheel base. Yeah, because it's short like this, it's going to turn really well and the grip and performance you get from all Hydrogen wheels are the best you can find. Absolutely. And now in the urban category, the hard boot is kind of a unique thing with Rollerblade. Talk a little bit about that. Well, a molded skate is really good at transferring energy and skating being a lateral sport like that, I mean, you can clearly see, if you skate up a hill, you can see how a molded skate holds its composure, you get so much more power and energy out of it. The Twister comes with a slider here on the side, a removable slider and you have 2 buckle closure so there's a buckle up top, a locking buckle and you also have an instep buckle here that really locks you down into the skate. For sure. And then talk a little bit about the actual fit of the boot. Yeah, the fit, you know again, you get a really snug fit. It's got the Pro Liner in this skate. It's very well vented as you can see. Actually, the shell is translucent so you can actually see through the shell. But yeah, it's, you know, it's everything our Twister 80 skate has upgraded substantially for performance. Definitely. And so, I mean, in this skate, a very unique skate, who is the customer for the Twister Pro? It's a pretty wide audience for a Twister, I mean, almost anyone can skate on a Twister. It's intended for someone, kind of a go anywhere, do anything type of skate. It's a performance urban skate is what we designed it for but what we found was it becomes a do anything kind of product. Awesome. 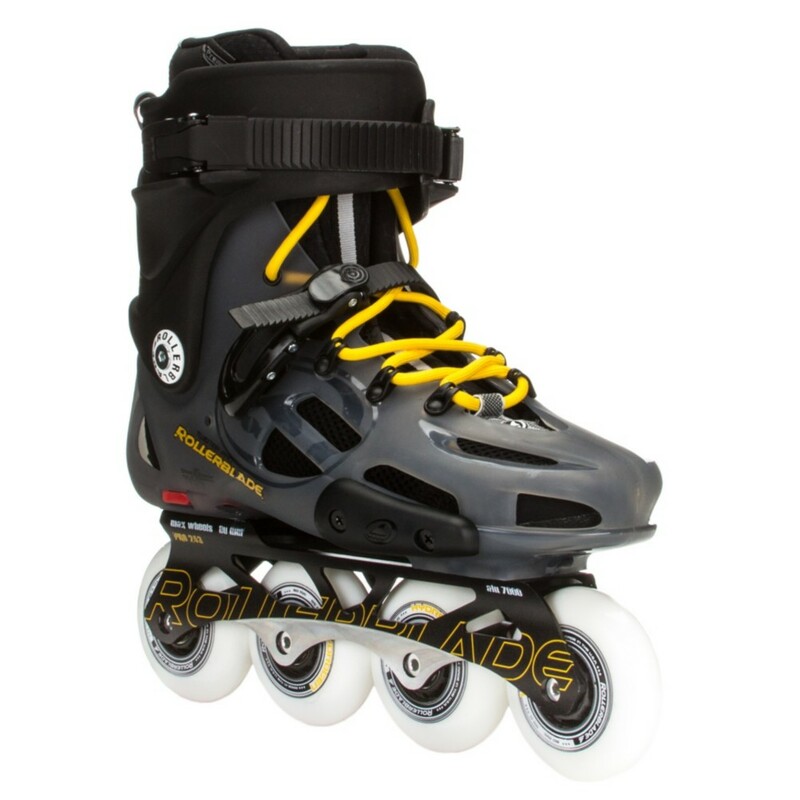 So, there you have it - the Twister Pro from Rollerblade. You can check them out on inlineskates.com and thanks for joining us on the Daily Spin.